Gorgeous view of the Hudson River. Although still under construction, the Visitor Center is one of the nicest we�ve seen. The grounds have a calming effect and the rose garden must be beautiful in season. We toured the house with a few older couples. Most tour groups we saw today numbered around ten � a perfect number for the size of the house. Our group was knowledgeable and inquisitive. We enjoyed their questions. Perhaps the most impressive feature of the FDR home, Visitor Center and Presidential Library is that it is fully accessible to individuals with disabilities. The group that toured the house after us included a father with his two sons, one using a motorized wheelchair and assistive technology. The fact that the family was able to enjoy the same experience as us is a fitting tribute to the man who was acutely aware of the narrow hallways and multiple floors in his family�s house. The FDR National Historic Site is located directly off a main road. Drive towards Hyde Park on route 9 and you can�t miss it. A perfect score. Wonderful bookstore. The most comprehensive selection of site specific books we have seen. Shelves contained the obligatory biographies but also books related to the time period and cultural history of Roosevelt�s Administrations. We picked up a magnet and a Works Project Administration Guide to New York City, still one of the most comprehensive guides to the city 70 years later. The Ranger who took us through the house was wonderful. We were never left wanting for information and each question from the group revealed new and interesting anecdotes. However, Secret Service at the Presidential Museum weren�t very helpful. Yes. But get there early to have time to see all the Sites in Hyde Park. 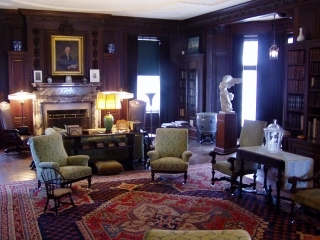 Four hours flew by at FDR and we would have had just enough time to visit all 3 before the 5 o�clock closing had the Vanderbilt Mansion NHS been fully operational.